Examine the history and emergence of playgrounds from the early 1900s. Assess the rise of safety and surfacing as a concern for North American playground designers. Describe modern playground equipment and its impact on the health and development of all children. Explore the sustainable aspects of playground design, including earning points for LEED certification. 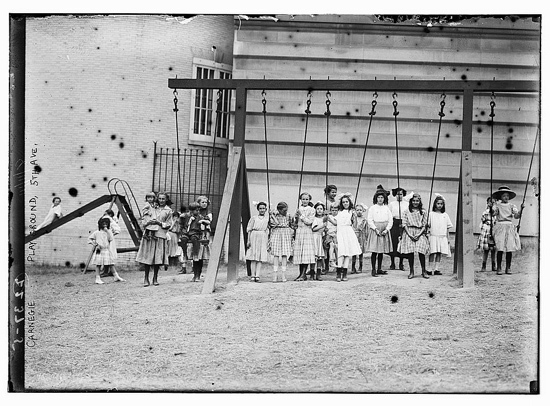 Prior to 1900, there were virtually no playgrounds in North America. As population moved from farms to cities, playgrounds were seen as a way to keep children busy and out of trouble. Since then, both the art and practice of playground design have expanded to include safety, accessibility, and inclusivity, and to encompass and foster child development. Playgrounds have helped earn points for LEED and other certifications, and equipment manufacturers have adopted sustainability programs. 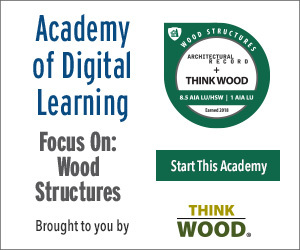 This course looks at the architect’s and landscape architect’s roles in the past, present, and future of playground design and specification. While the concepts remain similar—providing a place for fun outdoor activity—playgrounds over the century have become more varied, interesting, inclusive, accessible, and safe. Children have always played. Ancient pictographs, artifacts, and written history affirm that outdoor physical play has been an enduring, critical element of human development. Even in animals, play is critical to development. Baby lions, bears, and wolves tumble, wrestle, and learn how to move, balance, and interact, gaining strength and awareness of themselves and their environment while learning skills for future survival. For humans, the value of outdoor physical play is long established as being critical for development of physical strength, creativity, and social skills. However, outdoor physical play now competes with activities stemming from overly scheduled households, and even toddlers have become captivated with the fascinations of the digital world of tablets, cell phones, and online gaming. Sitting hour after hour after hour immersed in these pastimes, the child fails to develop some of the most basic skills. And as outdoor recess times in school playgrounds are increasingly cut in favor of other priorities, children sit even more. The results could be disastrous. This article discusses the history of outdoor physical play, particularly the playgrounds of the past century, how those playgrounds evolved to become safer and more inclusive, and how designers and playground equipment manufacturers have worked together toward those goals. Finally, we’ll discuss the playgrounds of the future and how today’s “child-saving movement,” reminiscent of the one at the turn of the previous century, seeks to return children to their rightful place, playing outdoors and enjoying the same opportunities for development that most of us enjoyed prior to the digital revolution. The basic physical, emotional, and spatial development of children through outdoor physical play is no longer a given. In North America, play was an established childhood activity long before European settlers arrived. Games among Native Americans were played to imitate such adult activities as hunting, gathering, and protecting the tribe. Even later, when settler children worked on the farm, there was time left in the day to play in the fields and streams and to interact with the farm animals. During the early 1900s, as a great migration began from farms to cities and from other nations to North America, the country felt a lack of play spaces. While some children took to playing in empty and abandoned lots, many tried to play in the streets, which was dangerous. In New York City, eventually, playing ball in the street was outlawed. While parks and playgrounds seem to us as natural as wind and sun, there was a time in North America when the idea of a public city park for play and recreation was a foreign concept. Over time, in an effort to provide city children a safe place to play and keep them away from dangerous city elements, concerned citizens started what was known as the “child-saving movement.” As part of that effort, lands for public parks were set aside and developed. The early playgrounds in North America were very different from those we know today. 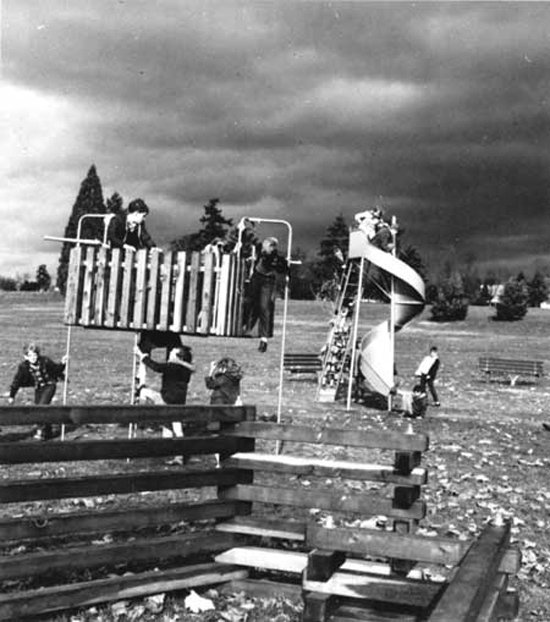 On these first playgrounds, play was composed of directed activities under adult supervision, unlike the free and spontaneous play on today’s playgrounds. Early playgrounds also had showers and places for art and creative work. An early North American playground with swings and a slide. During the Great Depression in the 1930s, the focus on playgrounds ceased because the country was broke and broken. The years during World War II saw all resources devoted to the war and much sacrifice on the part of citizens to fuel the war efforts. While the creation of parks and playgrounds slowed down or ceased during those years, children’s play did not. The building of playgrounds accelerated after President Franklin Delano Roosevelt created millions of jobs with The New Deal. Many of the parks and amenities created during this time of huge investment still exist today. Playgrounds tend to mimic and reflect the themes of the day. In the 1950s and 1960s, during the Cold War tensions with Russia and Cuba and the country’s obsession with space travel and missiles, playground equipment was created and shaped like rockets and airplanes. Some of those playgrounds still exist today. This playground reflected the world’s fascination with airplanes and jets. 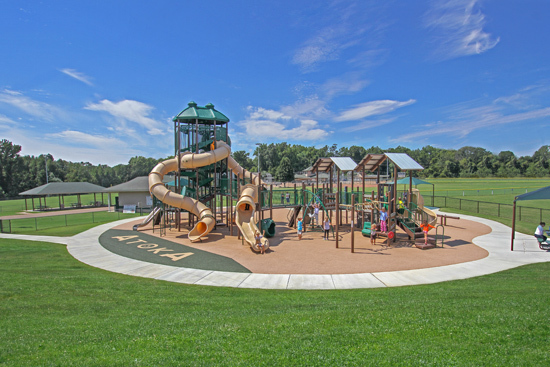 Throughout the history of playgrounds, designers and architects have played a major role, delighting children of yesteryear and inspiring playground designs even today. In 1966, architect Richard Dattner designed the iconic and very popular Adventure Playground, one of 20 playgrounds in New York’s City’s Central Park. The space just north of the West 67th Street entrance includes a granite-faced play structure that is a place to climb, a place to hide, and a maze. A massive stepped wooden pyramid topped with fitness bars gives children many ways to slide down.vi A low wall surrounding and defining the playground gives parents and caregivers a place to sit. The whimsical playground was in sharp contrast to the somewhat staid playgrounds of the Works Progress Administration (WPA) in the 1930s. The very popular Adventure Playground, designed by architect Richard Dattner, was built in New York City’s Central Park. “An environment that provides only the familiar challenges that already have been overcome countless times will never call forth any new learning,” Dattner wrote in his 1969 book Design for Play. Landscape architect M. Paul Friedberg also broke from the typical design of playgrounds in the 1960s with a series of spaces that included such adventurous features as tunnels, mounds, and tree houses.